Despite the wet & cold conditions 24 players aged from 15 to 55 from the East, West & Central regions of Switzerland competed in two matches at the Cossonay Cricket Ground at En Marche on Sunday 9th October. The first match was won by the Central Region and after a good curry lunch (compliments of Raja Hafeez) the second was won by the Western Region. Alex opened batting and scored 33 runs, took two catches and also bowled with good pace and took 3 wickets. 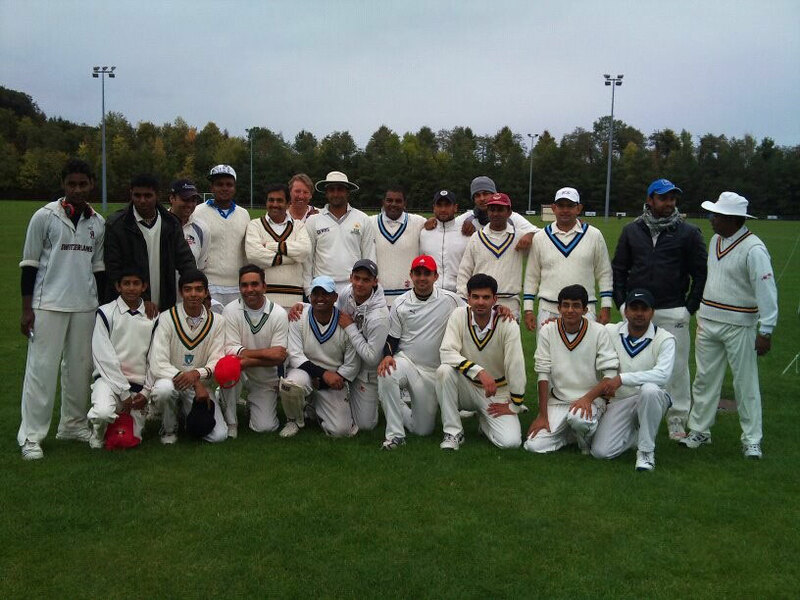 There were many good bowlers like Sudath from Zug CC who took 3 wickets. But the award was given to Dmello, as an upcoming cricketer, who not only bowled well but also batted well. Arjun is a very promising young off spinner. He is only 16 but bowled well to get 3 wickets. He is also a good fielder and will improve his batting skills a he matures in stature and in mind. Ali is 18 years old and an obvious candidate for the Swiss National squad. With his pace and in-swingers, he troubled senior players time and again. His new ball spell of 4 overs was terrific with the batsmen playing and missing hum umpteen number of times. He is also a capable bat. Mithun is an 18 years old left hand bat. During his stay at the crease he showed that he has the skills to be a good stylish top order bat with lot of potential. Saleem Awan organised awards from Lloyds-TSB bank and a small trophy was presented to Western division team as winners of the tournament. Dr. Lal also functioned as an official photographer. He will soon share with us the photos which will be published on this site.